Before – basically it looks like a couple of college students live in our house and just throw whatever in there and shut the door. We wanted to just get it organized so it will be nice when guests come over. We decided to get the same system we have in Chase’s room from the Container Store. It’s the Elfa Platinum Ventilated system. We did the customize your system feature they have to make sure it worked specifically for our space. During – So this was an easy update. Just pull out all the mess and repaint. 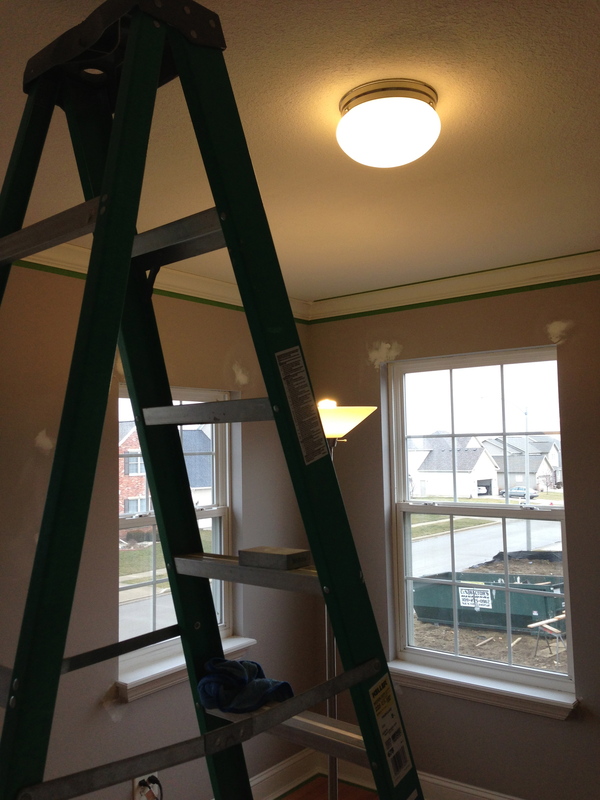 We chose a paint that closely matches the previous paint color. The main area and hallways are a butter cream type color that we got from Olympic when we had our house built, I can’t remember the color. We are planning to freshen up all the paint and decided to keep the same color type. This one is just a shade lighter, which I think makes it look brighter and works perfectly. It’s Parchment Paper by Behr. I can’t wait to get the rest of the house updated with this shade. After – Ah!!! Much better. 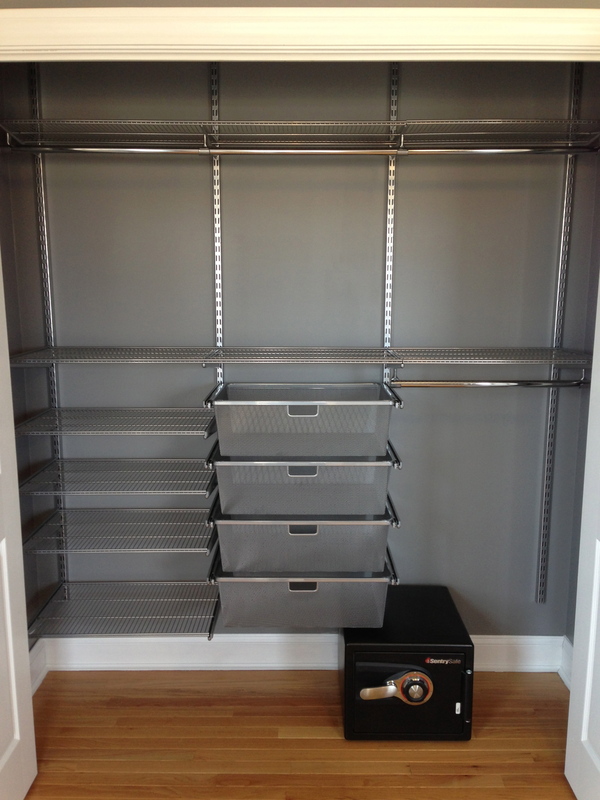 🙂 This version of the system “Platinum Ventilated” is inexpensive when it comes to closet organization systems. We were able to get this updated for $200. Now that we have a nice system I know that Rob and I will keep it uncluttered. 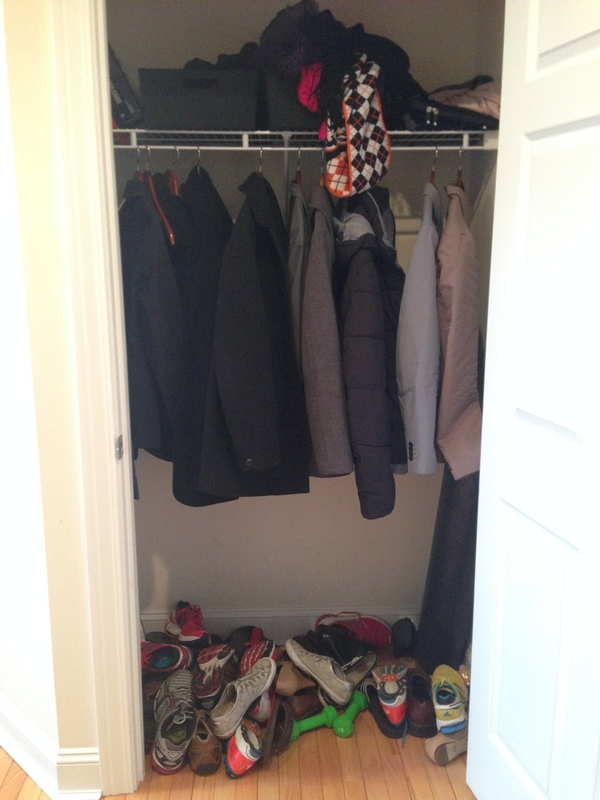 We don’t need 50 pairs of shoes in our downstairs closet like before. 🙂 It’s funny how an organization system seems to keep our messes in check. I love having the system in Chase’s room and I know I will love using this one. I can’t wait to update the rest of our house with these. Can’t wait to post more on home updates and organization! We’ve come to week 19 and I have to give a shout out to our friend and runner Drew for completing his first Goofy Challenge!!! We are so proud of you Drew and I wish we could have been there to run too! Rob made crazy progress on the nursery this weekend. He was able to finish filling and sanding holes, taping, painting trim, painting the walls and installing our closet organization system. He only has some minor touch ups to do and it is complete! 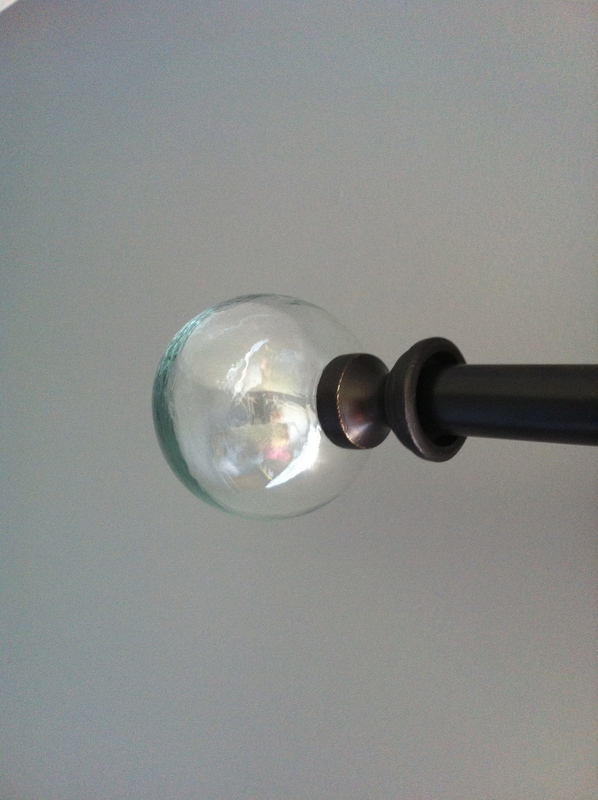 Here is the work in progress (and our temporary light fixture). Choosing the right neutral color for either a boy or girl’s room. 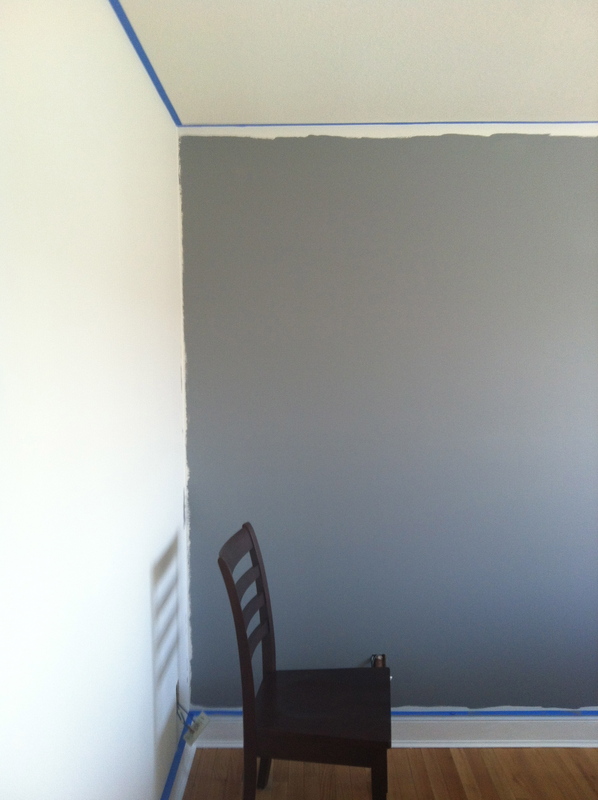 We went with middle color: Behr in “Anonymous” (Home Depot). Probably hard to tell in this picture, but a comparison of the first coat of the new color on the left and the old color on the right. All done! Now on to the closet organization system. 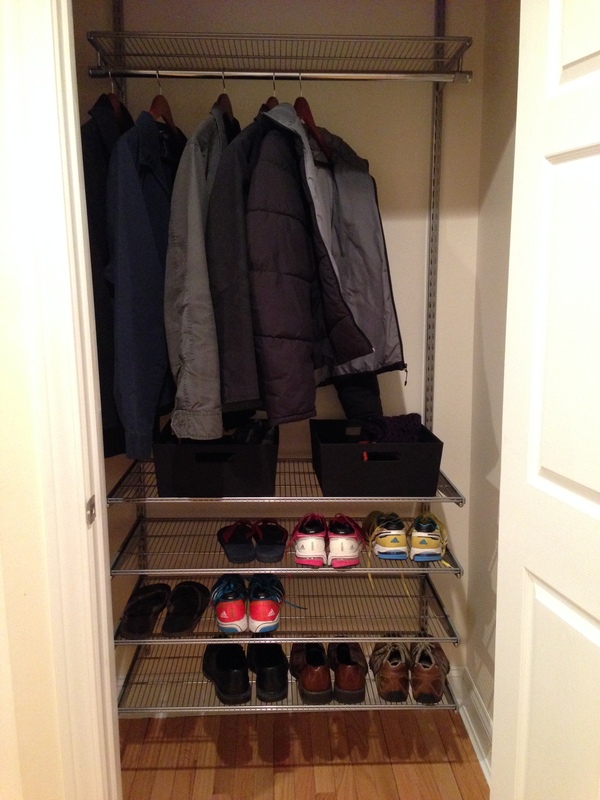 I love this new closet organization system from the Container Store. We went with a custom Elfa metal mesh series that we ordered online. 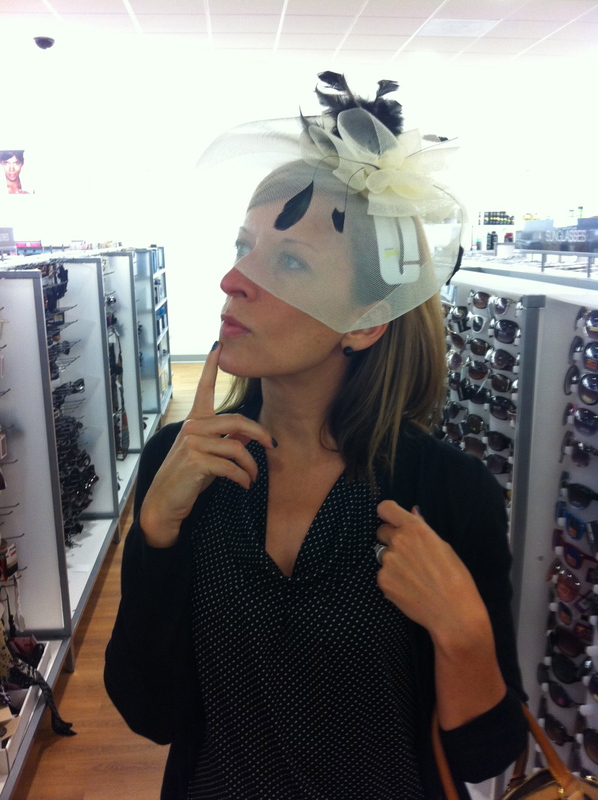 We tried going to one of the stores in person and it was utter chaos in there. 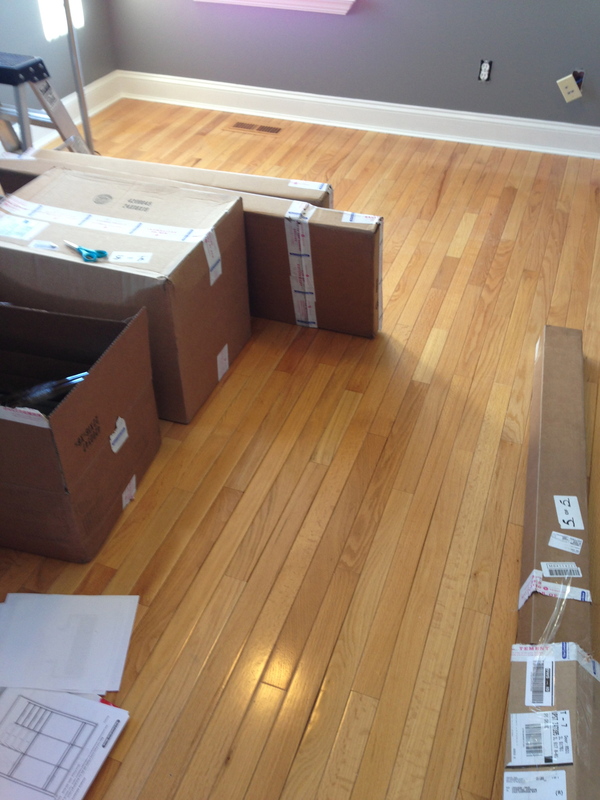 We decided it would just be easier to order everything online instead. Running has been better. I have still had some mediocre runs that I just turn into run/walks. 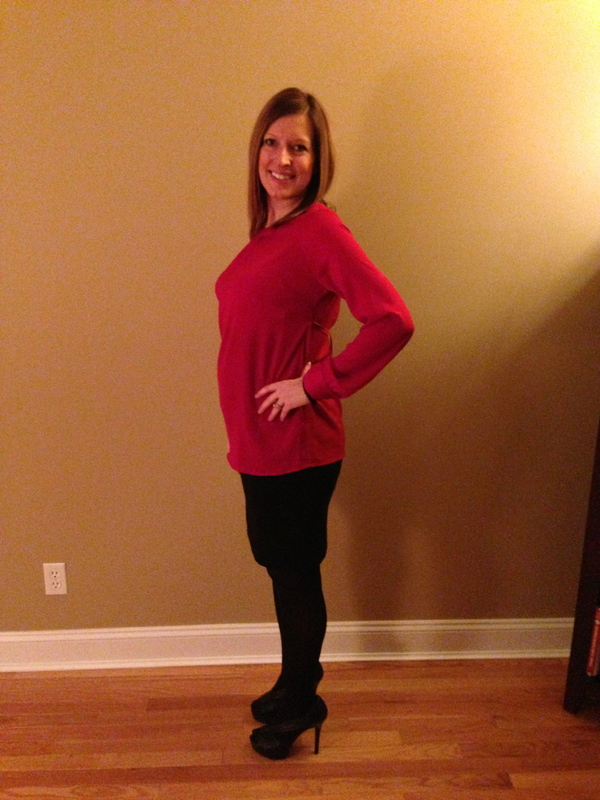 I also purchased a new pregnancy workout DVD. 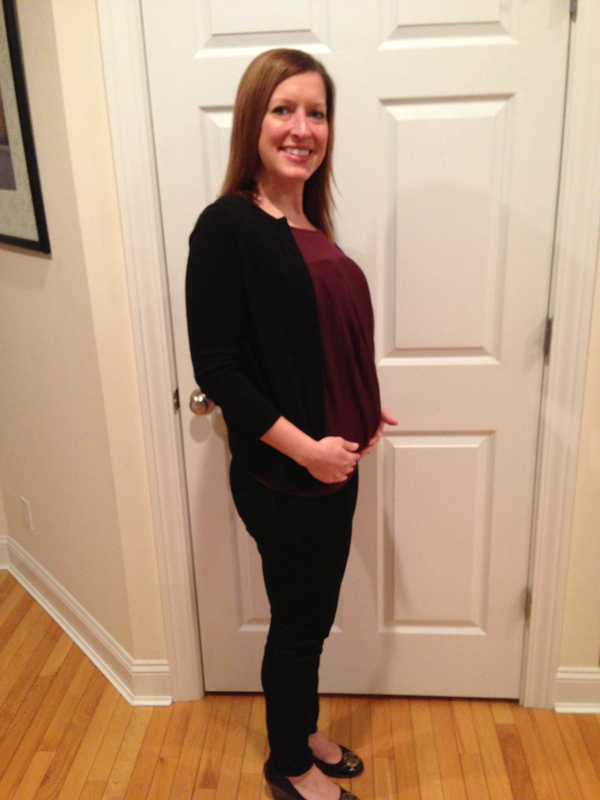 Tracy Anderson The Pregnancy Project with a DVD for each month. Apparently a sports bra for the workout DVD cover is too predictable, lingerie seems to be Tracy’s choice. I wish I would have ordered this at the beginning of my pregnancy, but I think it was released just recently. The DVD says to have 3lb weights, which I had to buy since I didn’t have anything that light at home. I thought “okay this is going to be a puny workout”, based on the tiny weights, but boy was I wrong. Tracy doesn’t disappoint by moving from exercise to the next so that the little movements really add up over time. She doesn’t give instructions that well, but it didn’t come across as annoying, I think it made her more real. I only wish that she would start each movement on her left side. Many times when she would start on her right, the camera wasn’t facing her movement so it was hard to know if I was doing it correctly. By the time she moved to the left side I could catch on better to the form. I think with time I will get the hang of her style. I plan to use this DVD often, but probably never two days in a row because it was challenging for my wimpy arms and legs. Here are my workouts since my last post. 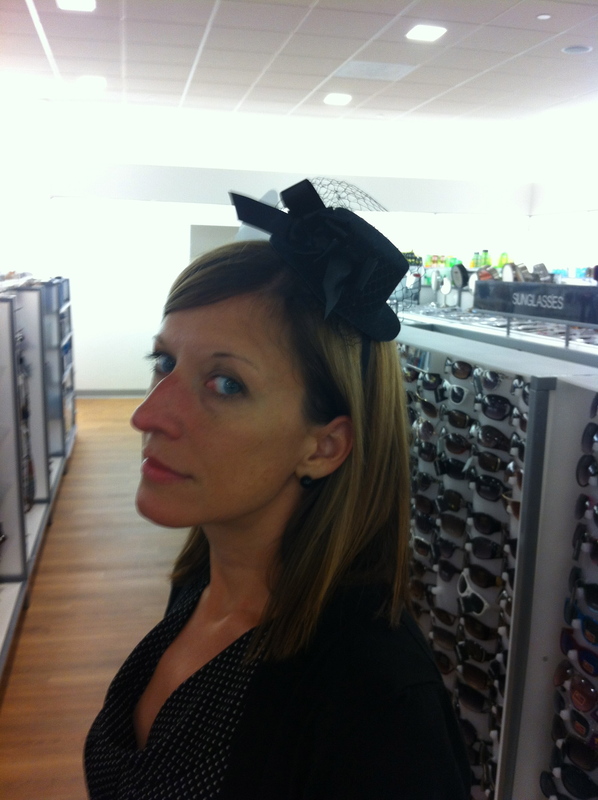 Categories: Home, Pregnant | Permalink. Rob and I had a big trip planned for work. Before we left we were getting our house spruced up for our Coco and Kitty sitter. 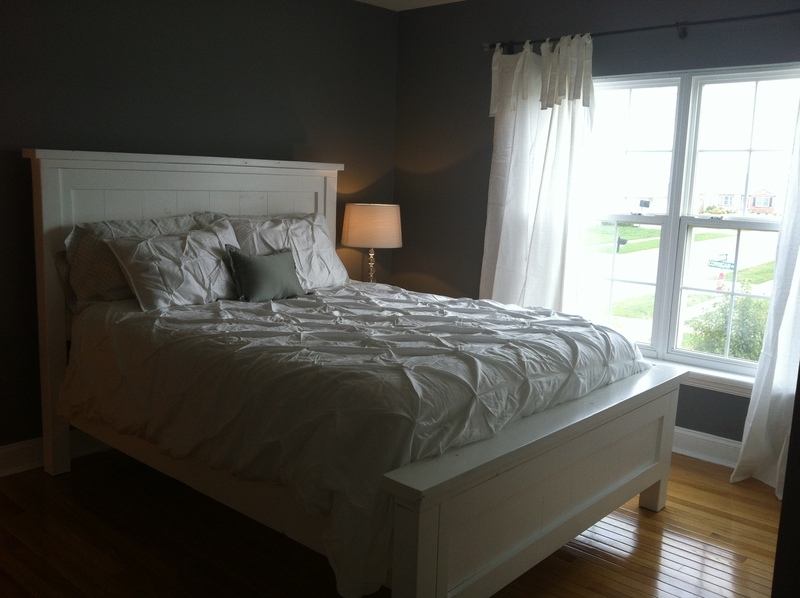 I finally got our master bedroom repainted. 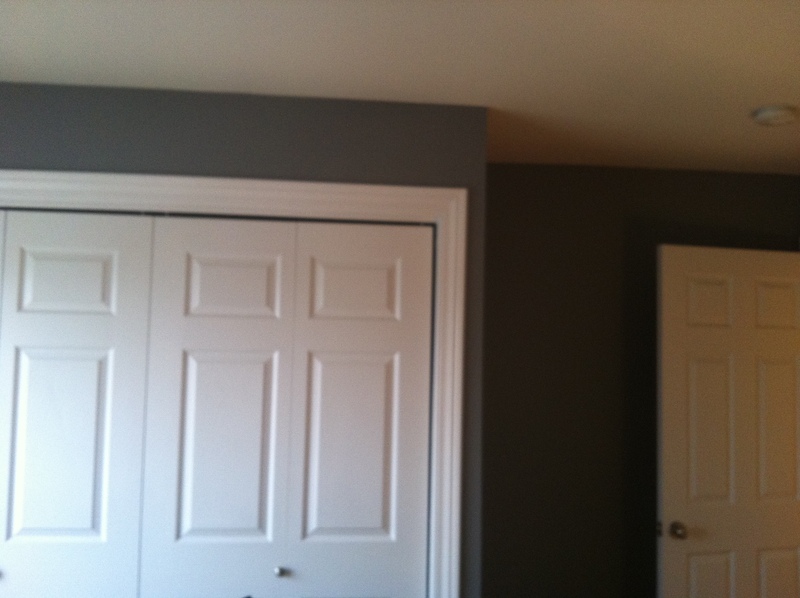 The paint we used was Behr in Dark Ash, which is one shade darker than Grey Area that we put in our master bathroom and one of the guest bedrooms. I love how it looks against our Pottery Barn silk tie drapes. 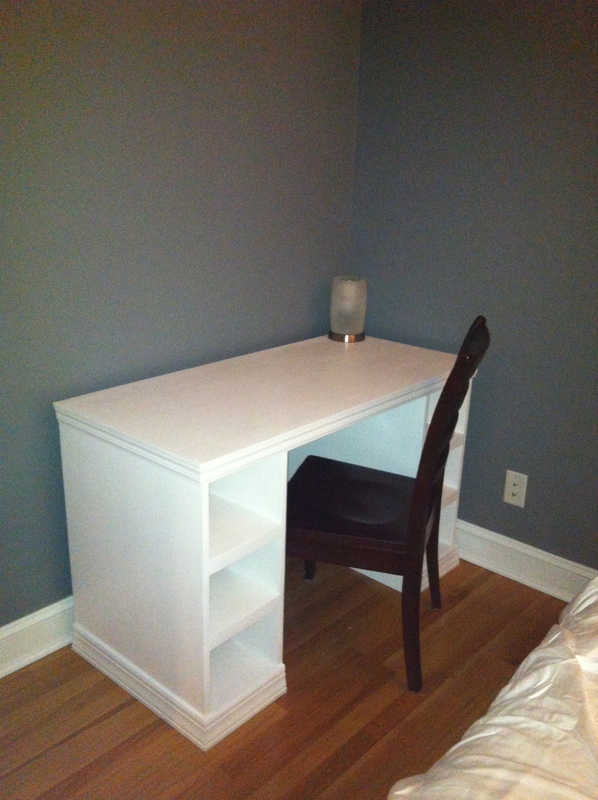 Also, Rob built a desk/vanity for the guest bedroom. I’m excited to get a chair, baskets for the cubby holes, and a pretty mirror to put up on the wall. Categories: Home, Out and About | Permalink. 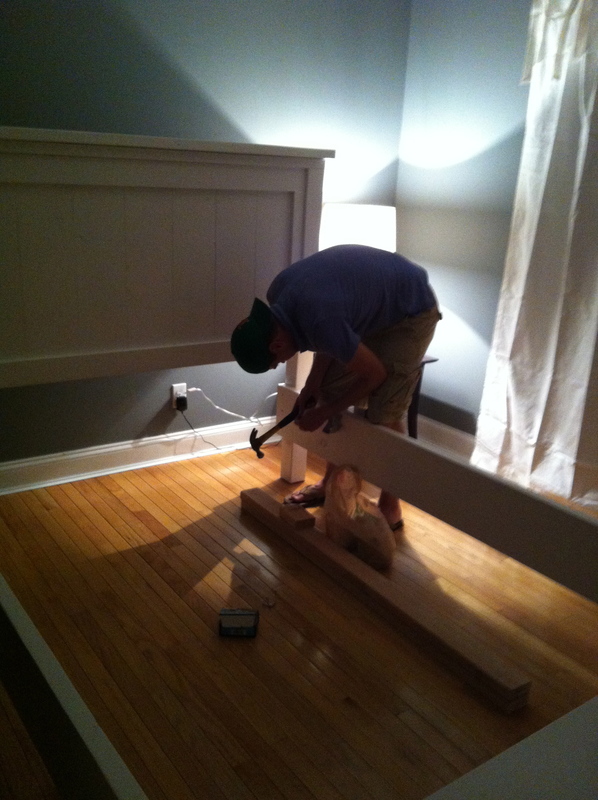 Rob and I have been working on various home projects, one of which was finally finishing one of our guest bedrooms. It’s one of those rooms in our house that really just got ignored soon as we moved in. I threw some paint on the walls 8 years ago and we put a bed, computer table and it had no style. Poor Drew stays in this room when he comes over and finally we will have a decent place for him and others to stay. This is not a running or flying post at all, but since house projects take a lot of our time lately I wanted to post what we’ve been working on. 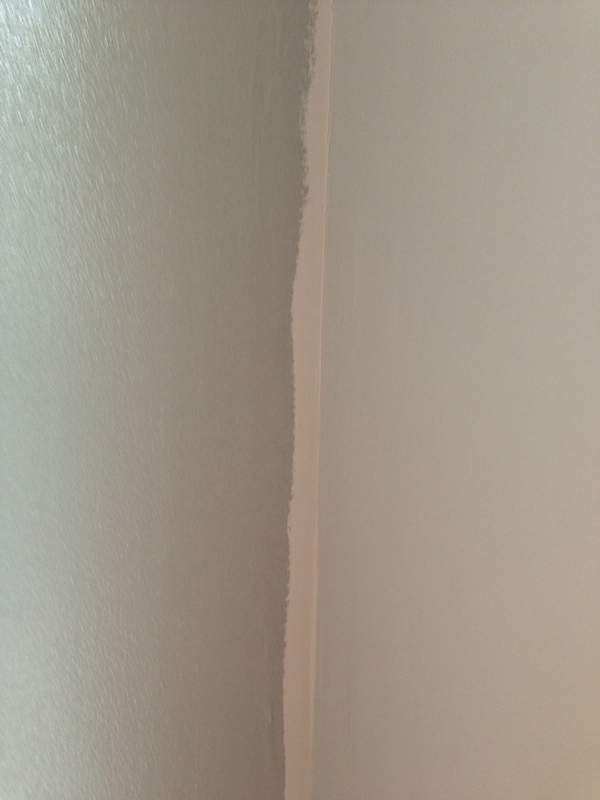 Here is a picture where you can see the original wall color, which almost looked white and was nothing exciting. 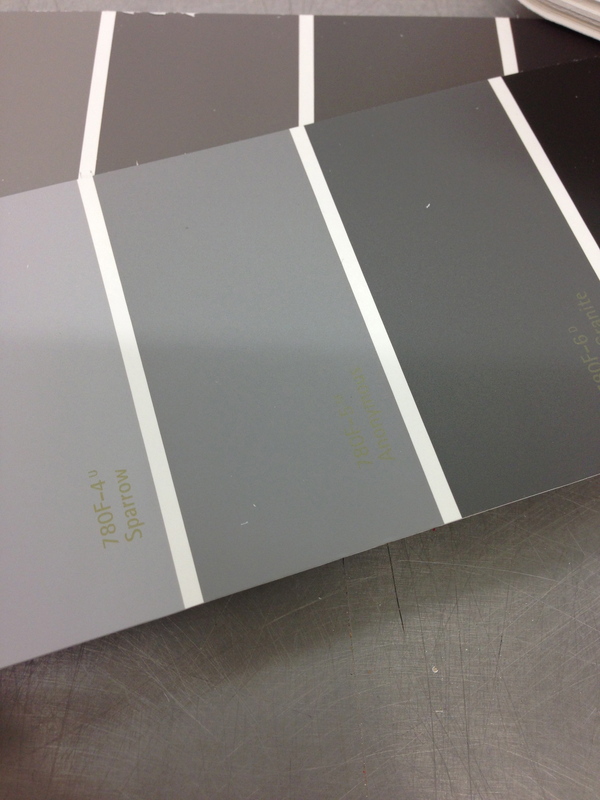 The original was Olympic in Palomino and the new is Behr in Grey Area. 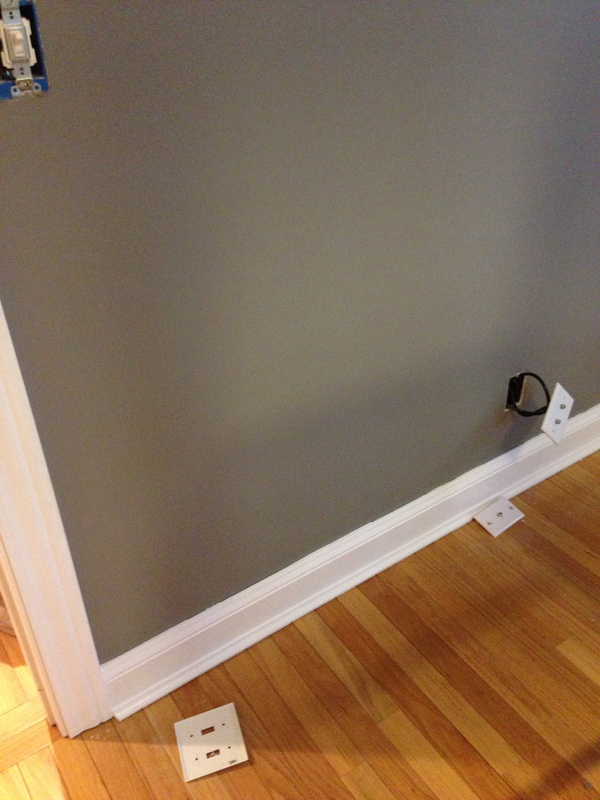 In this picture I had touched up baseboards and started the wall color. 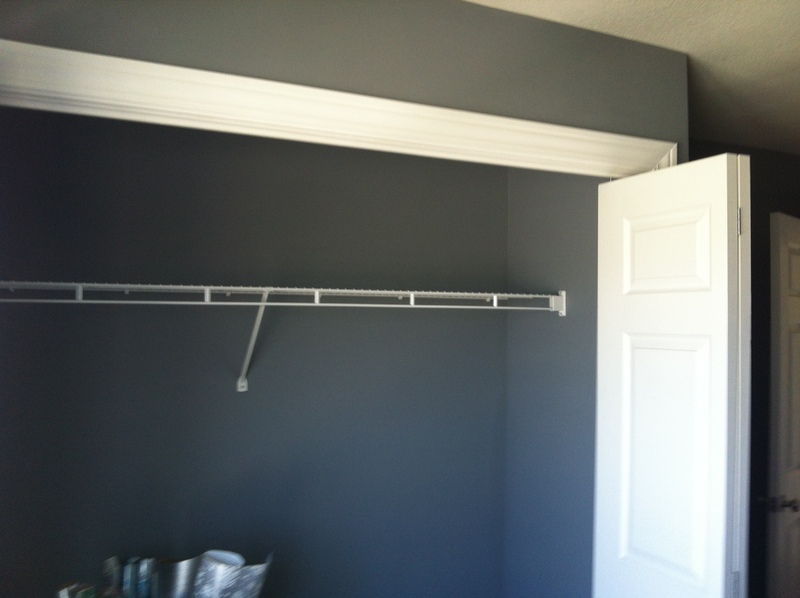 Grey Area is the same color that we re-painted in our master bathroom. 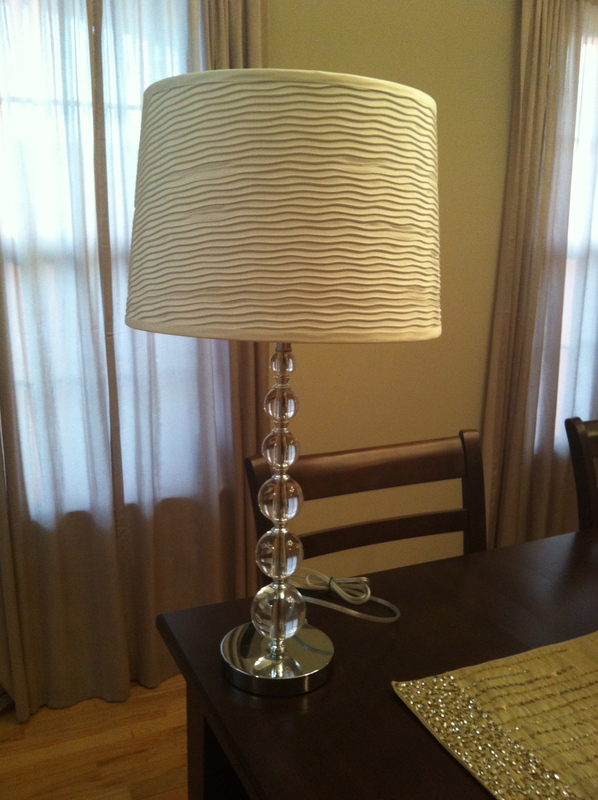 Lamp I bought for the room. More color progress on the walls and inside the closet. 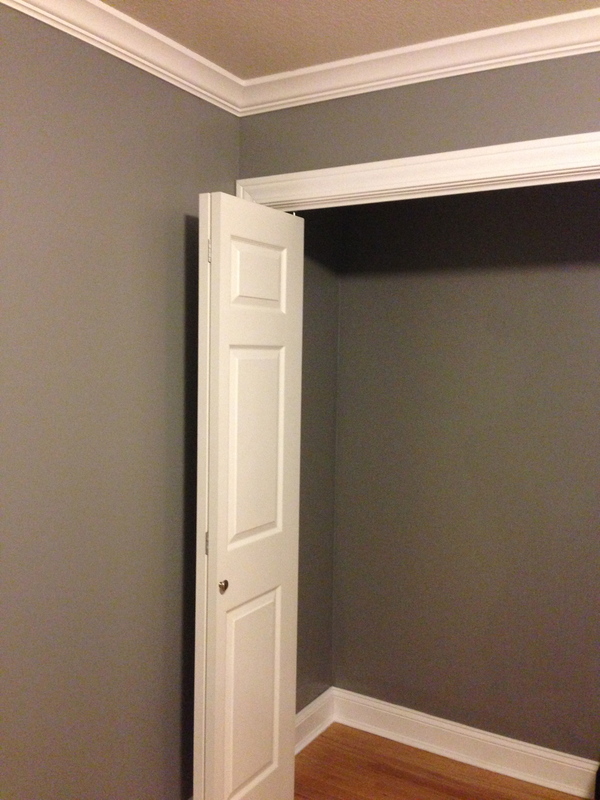 I’m a fan of the inside of the closet being painted to match the room. 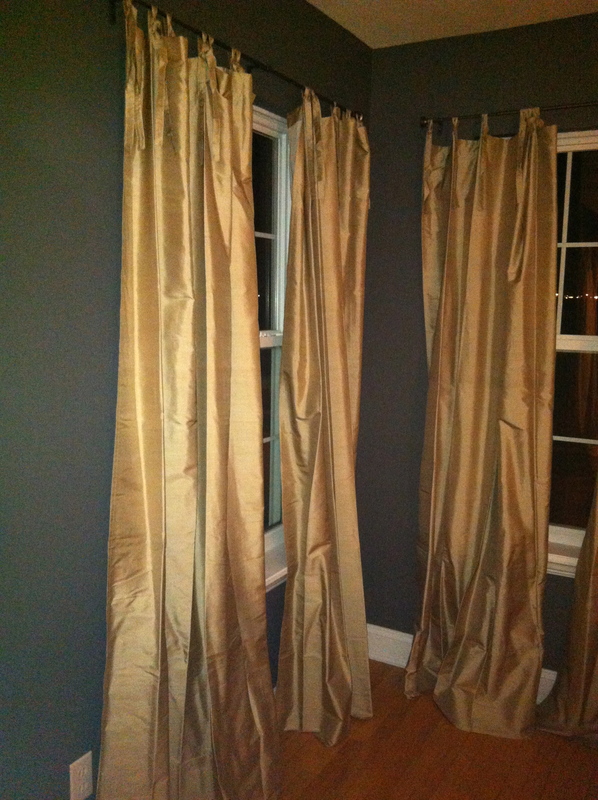 New drape hardware and curtains from Pottery Barn. 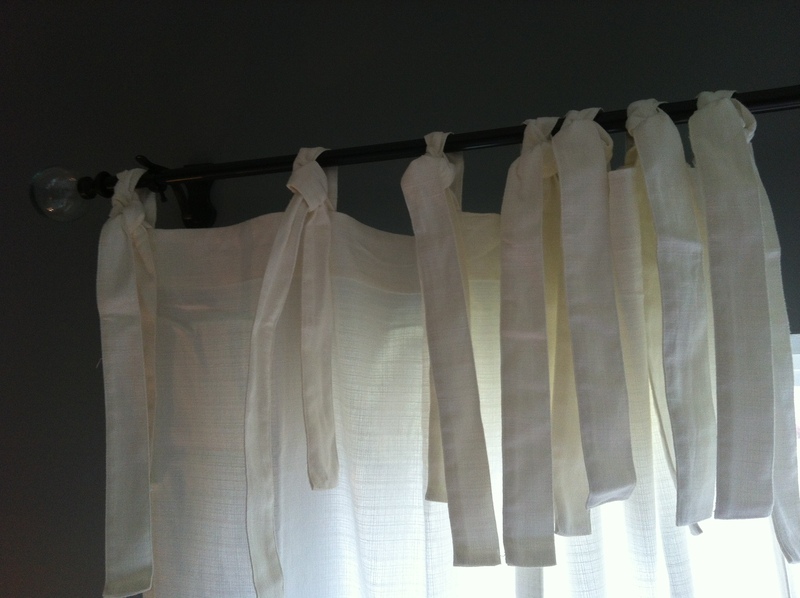 I love Pottery Barn tie top drapes, they make it easy to get the length just right and it’s more of a casual look. 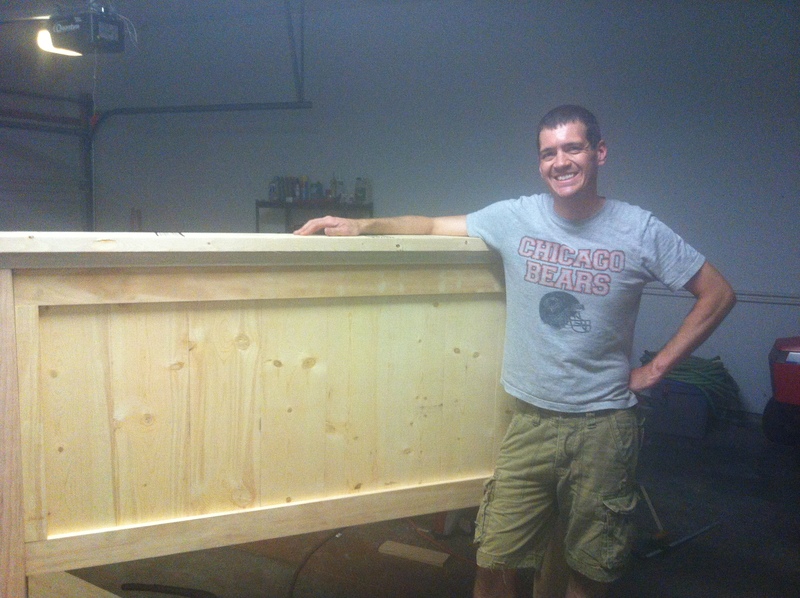 Up next, Rob built a bed from scratch. I had been looking for an option for this room and couldn’t find anything I liked. Rob offered to build plans using ones he found online on ana-white.com. 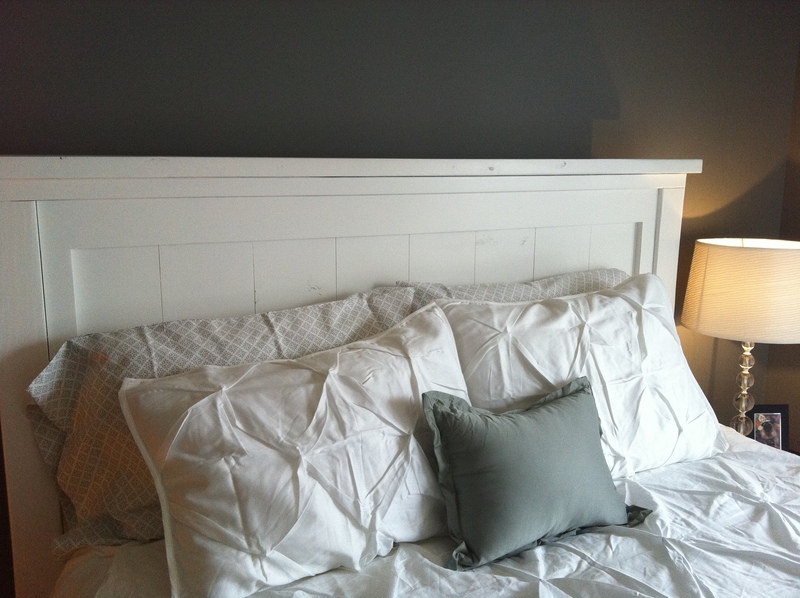 He made minor modifications to make it something we could disassemble easily and also so the frame wouldn’t require a box spring. 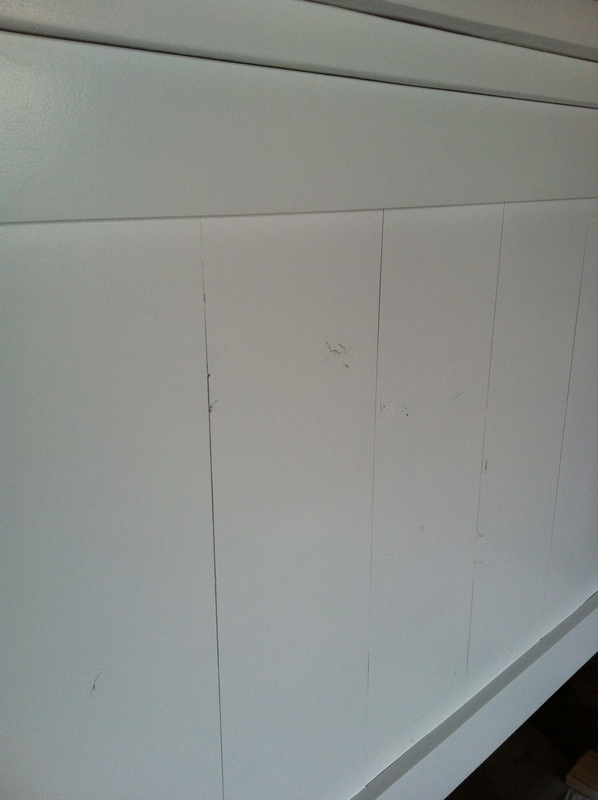 We used mid-grade wood from Mendards since we planned to paint it white in the same color as the trim. I wanted the wood to have distress and knots like a true farmhouse style. Our neighbor is a professional painter and offered to help spray the paint and even let Rob and I each take a turn spraying it. 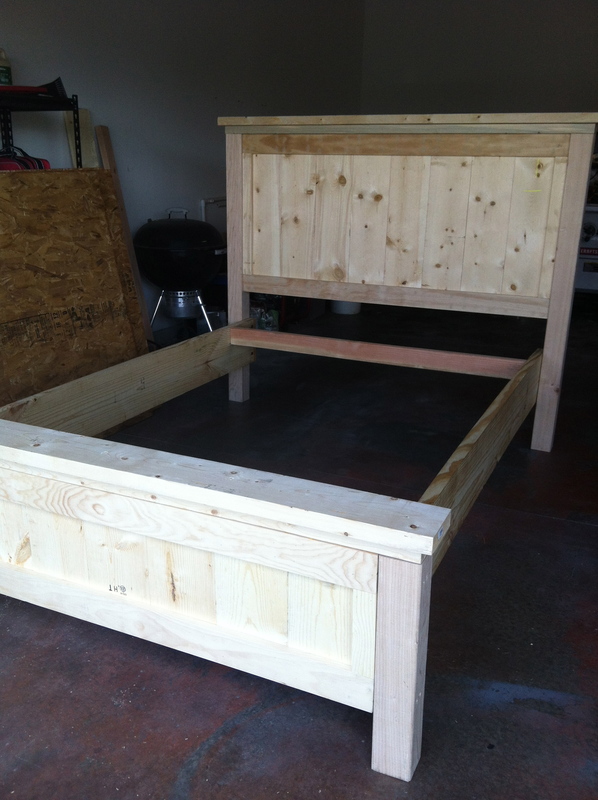 With materials and paint this bed cost less than $225 to make! It turned out absolutely perfect! I added new bedding I purchased from Target. All done! I still need accent pillows, wall art, an armoire, and vanity in this room. Those will come with time and who knows, maybe there are some more things Rob can make too! I’ll post updates as we add to this room.